The comfortflex sport harness offers you and your dog only the highest standards of safety, simplicity and security. Unlike many harnesses, the comfortflex sport harness is designed to protect sensitive areas, like your dogs throat and underarm, during any level of excercise. Due to the dynamic position of the leash connection, pressure is always directed directly to the chest, never riding up on the dogs throat. The simple yet effective design also lets your dog retain a full range of motion without having to worry about underarm irritation or chafing. Getting you dog into this harness is incredibly easy. 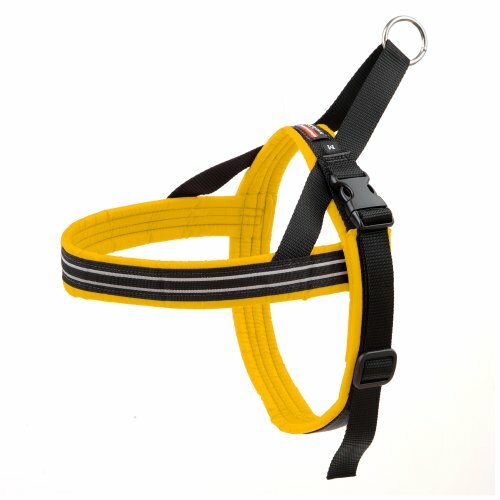 Just drop it over your dogs head, secure the velcro strap around his girth and connect the safety snap. With very little practice, this can even be done with just one hand. Reflective nylon staping is easy seen in low light situations. If you have any questions about this product by PetPDC, contact us by completing and submitting the form below. If you are looking for a specif part number, please include it with your message.